This action plan addresses recovery measures for the Northern and Southern Resident Killer Whale populations in Canadian Pacific waters. 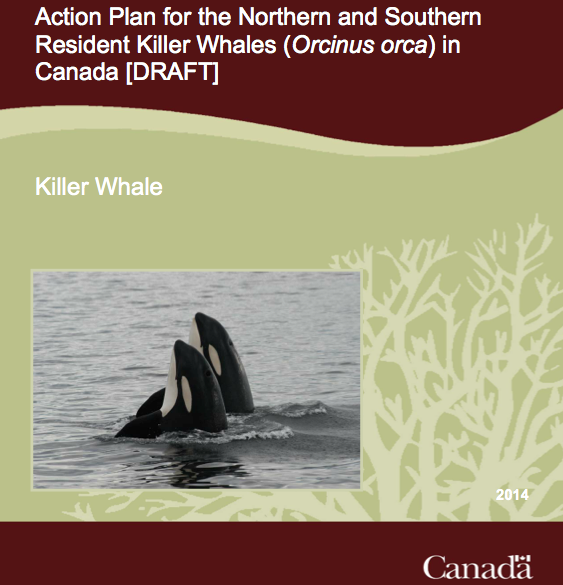 Through a series of technical workshops, consultations and meetings, recovery measures were developed to address the broad goals and objectives identified in the Recovery Strategy for Northern and Southern Resident Killer Whales (Orcinus orca) in Canada (DFO 2011).  Ensure that Resident Killer Whales have an adequate and accessible food supply to allow recovery.  Ensure that chemical and biological pollutants do not prevent the recovery of Resident Killer Whale populations.  Ensure that disturbance from human activities does not prevent the recovery of Resident Killer Whales.  Protect critical habitat for Resident Killer Whales and identify additional areas for critical habitat designation and protection. The impacts of the recovery measures in this action plan are unknown but likely positive, providing benefits to Canadians. Additionally, some research and threat mitigation activities will result in benefits to other marine mammals and sea turtles, including a number of SARA listed species. The anticipated cost of DFO’s contribution to recovery measures is low. The inclusion of financial and in-kind costs to partners will very likely push the overall costs of this action plan into the medium cost range on the national scale.